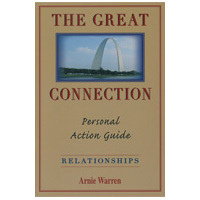 This Personal Action Guide is a continuum of The Great Connection Series. You'll find the benefits undeniable. Thousands have profited from The Great Connection story. It has become a world-wide classic in twelve languages. Now, the Personal Action Guide takes you a step further in your development. The Personal Action Guide gives you clearer insight into yourself and others; helps you begin relationships by understanding peoples' styles, traits, and, yes, their fear; and hones your DISC vocabulary skill to connect with people. Communicate with clarity. Interact with confidence. Experience meaningful relationships starting now. Use this action guide in an individual setting or in groups. This Personal Action Guide is a continuum of The Great Connection Series. You’ll find the benefits undeniable. Thousands have profited from The Great Connection story. It has become a world-wide classic in twelve languages. Now, the Personal Action Guide takes you a step further in your development. The Personal Action Guide gives you clearer insight into yourself and others; helps you begin relationships by understanding peoples’ styles, traits, and, yes, their fear; and hones your DISC vocabulary skill to connect with people. Communicate with clarity. Interact with confidence. Experience meaningful relationships starting now.